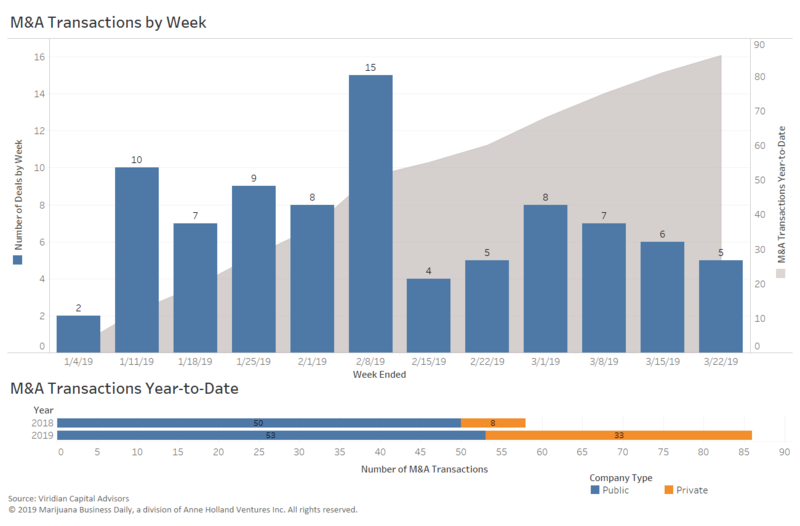 M&A deals closed by publicly traded companies were essentially the same year-over-year (53 in 2019 versus 50 in 2018), but private company deals clocked in at 33 so far this year, compared with just eight for the same period in 2018. 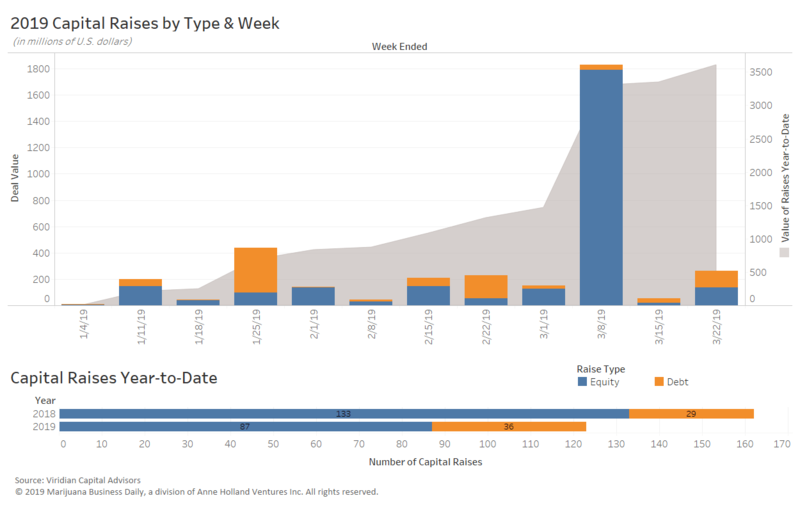 The data below, provided by Viridian Capital Advisors, is through the week ended March 22. Cansortium, a Miami-based vertically integrated cannabis company, raised more than $56 million ahead of its initial public offering on the Canadian Securities Exchange. The proceeds will be used to expand the company’s operations in Florida, Michigan, Pennsylvania, Texas, Puerto Rico, Canada and Colombia, as well as for repayment of debt and general working capital purposes. Minneapolis-based Vireo Health closed on a private equity placement worth $51.4 million. The deal was made in conjunction with the company’s reverse takeover of Darien Business Development Corp., which allowed Vireo to begin trading on the Canadian Securities Exchange on March 20 under the ticker symbol VREO. Most of the completed mergers and acquisitions of the past week were reverse takeovers (RTOs), as more private companies sought access to public markets in Canada. Infused product and extract companies Nextleaf and Orchid Solutions took this step via RTOs with Legion Metals and Earny Resources, respectively. Ontario-based Canopy Growth acquired private hemp producer AgriNextUSA. The cash-only deal, described by Canopy as not material, was the latest move by a Canadian giant to dip a toe into the U.S. hemp market this year. Canopy trades on the New York Stock Exchange under the ticker symbol CGC and on the Toronto Stock Exchange as WEED.